In my youth, I regularly told anyone who asked that I was never going to get married. The concept seemed foreign to me -- especially when it came to the idea of sharing finances. All I could think was this: Why would I want to share the money I earned with someone else? And even more so, why would I want to ask somebody for permission to spend my own money? Obviously, I had a lot to learn. The love gods saved me from myself. One day, while on a business appointment, I was fortunate enough to meet the woman who would be my wife. I succumbed to that most cliché of clichés, love at first sight –- and lucky for me, she felt the same way. The formula for the potion in which Cupid's arrow is dipped is a mystery, but its effect was to relieve me of any fears about commingling money. I wanted us to combine bank accounts, both contribute to our household finances in whatever capacity we could and discuss –- not ask permission –- how we spent our money. Again, I was lucky in that we both shared similarly non-extravagant sensibilities on spending. I soon found out that not all couples were like us. Since my wife is Catholic, part of the process to get married in the church was to attend marriage preparation classes called Unitas. The classes helped couples better understand and deal with issues that they would encounter in their marriage -- including financial ones. One night, the instructor asked all the couples to turn their chairs back to back. He then gave each person a sheet of paper and asked everyone this question, "What is the most amount of money you would spend on impulse –- not including special occasions like birthdays, anniversaries and holidays -– without first consulting your partner?" We were instructed to write our amounts down without showing our partners. "OK," he continued, "now stand up, turn around and face your partner -- but don't show them your number yet." You could hear nervous laughs and giggles. It seemed like a fun but silly exercise, with everyone assuming that their partner's number would be pretty close to theirs. "Now show your partner your number," he said. The laughs and giggles turned into groans, gasps of disbelief and in one case, the statement, "You've got to be crazy." All around the room were the stunned expressions of those who had, up until that moment, thought they were fairy financially simpatico. Though a few couples had numbers pretty close to each other, the average difference for the rest of the room was $500. The biggest difference $49,950. Yes, you read that correctly. One young lady wrote "$50" on her piece of paper, while her fiancé wrote "$50,000" on his. When the instructor asked incredulously what he would impulsively buy for $50,000, he said, with a straight face, "I might want to buy a car, like, maybe a Hummer." Though Arnold Schwarzenegger might have considered that a proud moment, his partner did not feel the same way. She just sat there, with a blank stare on her face, understanding that everything had just changed. The financial equivalent of the question "Is it OK to cheat on your wife?" had been asked, and her fiancé had answered "Yes." They never did walk down the aisle, at least not with each other. I had written down "$100," while my wife had put "$50" -- close enough to be financially compatible. But point of the exercise was not lost on me, and I've thought back to it a number of times in the years since, on those occasions when I wanted to buy something particularly expensive. And each time, before I did, I made sure to talk to my wife to make sure she was OK with it. 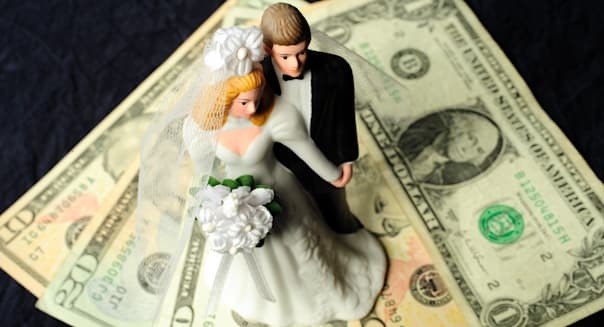 According to a 2013 survey of certified divorce financial analysts -- a profession whose mere existence should illustrate how important a good financial fit is in marriage -- the third most-common reason for divorce in the U.S. is money issues. This comes as no surprise to me, as I know couples who after years of marriage keep separate checking accounts, don't consult each other on financial matters and maintain the mentality of "my money" and "your money." No matter what you think of the institution of marriage, if you enter into it and truly want to make it a success, you have to understand that by its very nature that it requires transparency and compatibility when it comes to finances. I can only thank my lucky stars that I let go of my naive and immature views on money, because if I hadn't, my life would be a whole lot different than it is now –- and not in a good way. The Lund Loop is a free once-weekly curated slice of what I am writing, reading and hearing about in finance, tech, music, pop culture, humor and the good life. But not sports or knitting ... ever!